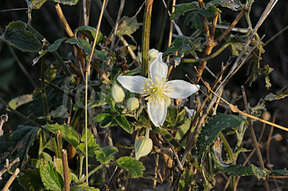 Climatis simensis is an important medicinal plant in Ethiopia. An experimental study was conducted on the crude extracts of the leaves of C. simensis to screen the major phytochemical constituents, evaluate the antibacterial activities and assess the antioxidant activities. The antibacterial activities of the extracts were evaluated using agar disc diffusion method, Minimum Inhibitory Concentration by broth dilution and Minimum Bacterial Concentration by plate counting agar. Antioxidant activity was determined by Phosphomolybdenum reduction assay, reducing power assays and hydroxyl radical scavenging activity. The phytochemical analysis indicated the presence of tannin, flavonoids, polyphenols, and terpenoids in the leaves of C. simensis. Among the test bacteria, Staphylococcus aureus was found to be the most susceptible bacteria followed by Pseudomonas aeruginosae with a mean zone of inhibition of 12 mm and 10 mm, respectively. Moreover, the antibacterial activities of the plant extract for each bacterial strain were statistically significant (P<0.05). According to Phosphomolybdate reduction assay, the highest antioxidant activity was ethyl acetate fraction at 0.99 µg AAE/mg with 500 µg/ml concentrations. In all tested bacterial strains, the inhibition zone agreed with its MIC and MBC values. Therefore, further investigation should be conducted on antimicrobial activities and identification of the antioxidant constituents of the plant using other veterinary important species and strains of bacteria.